Teeth grinding is normal for a lot of young children. Most children do not even realize they are doing it, and it usually does not cause any discomfort. Often times parents say they can hear their children grinding their teeth from down the hall at night. Teeth grinding usually stops as children start to develop adult teeth, and for that reason, we generally monitor this. However, if the grinding is getting worse over time, or if we start to see wearing down of the adult teeth, Dr. Mona may recommend treatment. Over time teeth grinding can cause wearing away of the chewing surfaces of teeth. This can lead to teeth that look shorter than normal or have dents, jaw pain, as well as headaches. Some older children and adults grind their teeth because of stress or anxiety. In older children that have all of their adult teeth in, Dr. Mona may recommend a special mouth guard that can be worn while sleeping. Canker sores occur inside the mouth, and cold sores usually occur outside the mouth, usually on or near the lips. Whether they occur inside or outside of your mouth, they can be very annoying! They tend to appear when children are sick, when the seasons change, or can even happen due to some food allergies. These sores are very common and for some people they recur often, depending on genetics. Unfortunately there is no quick fix that will eliminate these sores right away. These sores usually heal in about two weeks. In the meantime, Dr. Mona recommends a mild/bland diet that can help reduce discomfort while eating. Foods that are too hot, spicy, or crunchy can be very irritating. The most important thing to remember is to keep your child hydrated. Your child may not be eating or drinking like normal, and we do not want them to become dehydrated. Over-the-counter topical anesthetics are never recommended. They can cause lots of irritation, stinging, and are very unsafe if too much is eaten. Thumb and finger sucking or even pacifiers after the age of four is not recommended because it could lead to changes in the way your childs facial bones are formed. This can cause narrowing of the upper jaw, crooked teeth, bite problems, the upper front teeth may start to tip out, or your child may develop an open bite (front teeth do not touch when biting down completely). These habits can be very difficult for some children to break, and for that reason, it is very important that we work together to figure out what will work best for your child. For some children, a mouth appliance can be a very effective reminder to help get them through breaking the habit. A tooth cavity is the result of bacteria in your mouth producing acid which can weaken your tooth. Over time, this weakened tooth structure can grow, and the bacteria can start to move into the deeper layers of a tooth. Often times, the tooth can become so weakened that it causes a hole to form. Some people are more prone to developing cavities than other people. To give your child the best chance of not getting cavities it is important to remember a few things. Anything that has sugar and sticks to teeth for a long time can potentially cause cavities. Foods such as fruit snacks, granola bars, crackers, and gummies can sit on your child’s teeth for hours. Even some healthy foods such as fruit has a lot of acid which can cause cavities The best thing to do is rinse with water, or brush the food off of their teeth after these snacks. To help very young children not get cavities, try to avoid putting your baby to sleep with a bottle containing anything that may have sugar (milk, formula, juice). If your child needs a bottle to fall asleep, try plain water, or water flavored with a sugar free sweetener. Even breast milk has sugars that could potentially cause cavities. For children being breast fed, try to wipe their teeth after feeding to help get some of the sugars off of the teeth. Gingivitis causes the gums to become red, swollen and easily bleed when brushing or flossing. You may also notice persistent bad breath. Gingivitis happens when bacteria sitting on the tooth near the gums for an extended time. The best thing to do to help prevent this is to brush all of your child’s teeth where the tooth and the gums come together. This is the location where most plaque and bacteria tend to sit. Baby teeth actually start to develop while they are still growing in their mommy’s belly. From birth to about the age of 3, you will see the gradual eruption of 20 baby teeth (primary teeth). When babies are teething, they often have sore and tender gums. The pain usually can be soothed by gently rubbing their gums with a clean finger, or a wet gauze. A clean teething ring to chew on also may be helpful. At around age 6, the front baby teeth on the bottom generally start to get wiggly and fall out. At the same time, the adult first molars start to grow in behind all of the baby teeth. The process of losing baby teeth and getting adult teeth usually lasts until age 12 or 13. However, every child is unique and special, so this is just a general timeline which may be very different for normal kids. Dr. Mona will let you know during each exam if she is concerned about your child’s teething pattern. It is important for us to keep your child’s baby teeth healthy because they ultimately affect the development of your child’s permanent teeth. Baby teeth are important for eating, ensuring the adult teeth grow in normally, development of the jaw bone and muscles, speech and confidence. 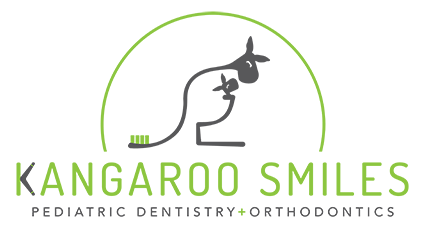 At Kangaroo Smiles we always encourage taking good care of your child’s baby teeth. Just as in adults, cavities and infection in baby teeth can cause a lot of pain. If your child loses a baby tooth too soon the permanent tooth may not be ready to come in. Sometimes having this extra space in the mouth can cause the other teeth in that area to start to shift. This may lead to teeth becoming crowded or crooked. In many cases, future problems can be avoided by space maintainers, which are appliances that hold surrounding teeth in place. The first permanent molars begin erupting around the age of 6. They start to grow behind all of the baby teeth. Extra care should be given to this first set of molars because they can cause a significant impact on the structure and position of future erupting teeth. From then on, children will continue to loose and gain teeth over the next few years. By about age 14, most kids have a full set of 28 permanent teeth. Wisdom teeth, or third molars, typically start to develop in early teenage years, and may start to erupt into the mouth in the late teenage years. In some people, wisdom teeth do not grow in properly and often times this can lead to infections. Wisdom teeth can also become impacted if they start to grow in the wrong direction, requiring them to be extracted. Wisdom teeth are evaluated at each visit, and sometimes Dr. Mona may choose to refer you to see an oral surgeon for evaluation and possibly to have them removed.